Last week, we learned that the median household income in the U.S. 2015 had jumped by around 5% to $56,000 a year. The news was greeted with good cheer and David Brooks even wrote a column in the Times proclaiming that capitalism is not broken. Because $56,000 a year does not seem like a lot of money, I had to make a simple query and the St. Louis Fed gave me a quick and simple answer -- inflation adjusted, this record level of median income is only about 22% higher than the median income in 1984. That is not a large gain over 32 years. The S&P 500 is up more than 1,300% in that period. If three decades counts as long term (it had better) and if in the long run, stock prices reflect discounted future corporate earnings (they had better) then it seems our own system is telling us something about how earnings are shared in late capitalism. Put another way, had median household income increased at the same rate as the stock market, it would be over $600K a year right now. The objection will be that wages can't compound like investments can. I get it. But there's nothing to compound without future earnings and profits are what's left over when revenue exceeds expenses. The cost of labor is a major expense. It's not hard to see who is getting compounded on here. It's also the case that in a world of $600,000 median incomes, a Ferrari would likely run north of $5 million. But inflation can be managed and not every price runs with it, in any event. The contrast of returns tells a story I just haven't seen elsewhere -- you will never get rich working for a living. Thanks Mike. I appreciate your analysis. As a critic of aspects of President Obama's economic program, I acknowledge that during the last two years of his administration, working and middle-class family income did rise significantly. 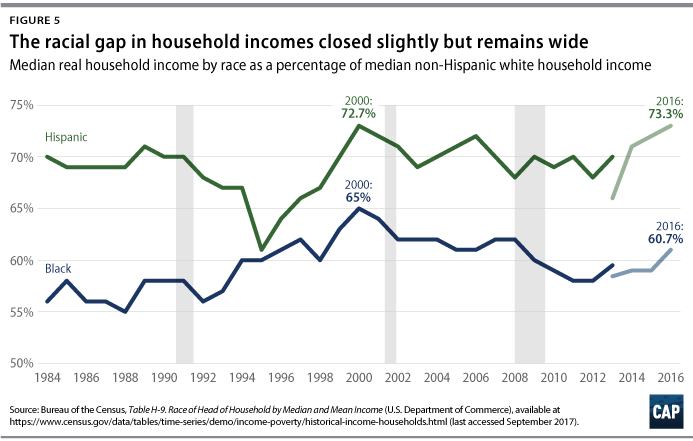 Also of import is that non-Asian people of color saw household income rise at a higher rate than whites and Asians did, although the latter two groups were doing better and lost less ground than blacks during Obama's early years. The income chart below is from the Center for American Progress. The area shaded less darkly indicates a revised method of calculating median household income. Bump in U.S. Incomes Doesn’t Erase 50 Years of Pain by Pat Cohen, Sept. 16. So this date of the reversal of "the American dream" already happening in the last 60's fits my version of reality well! But there's a much more important and bigger point it makes for me! Let's look big picture! And remember it's now 2017. History! Is it not that this middle class American dream just a blip of a couple post WWII decades?! Why do we expect it to be the norm? Why do we keep talking like something that happened to a victor in a world war after their was major destruction is the norm? When it happened for such a very short time. All those supposedly well-paying working class jobs were actually the result of starting out from destruction. Should we be giving more credit to the Marshall Plan for the middle class growth in the U.S.? Do we need to have a huge war every couple decades to keep a middle class? ETC. All I am suggesting with questions like that is that people should start taking a bigger view, more outside the usual box, now that it's been 50 years since it last happened! And that it only happened for a short time. Was it an anomaly, the result of WWII. And the view should be global. We did have the first rise of a sort of "middle class" with the Industrial Revolution, where many more people were allowed into the capital game, later dismissively named the "bourgeois." A new class, between peasant and worker and upper. We also had the experience before and after that of people emigrating to the new world (U.S., Canada, Australia, etc.) to pursue ownership of their own land to climb out of peasant class. The whole pioneer, westward the empire thing, mad crazy land rushes and gold rushes, with average people trying to be capitalists and risking it all, Donner party style. Which brings me back to a thought about my parents, and what I actually lived. I distinctly remember when there were no credit cards of any kind and no access to credit for "the middle class".I remember that because my father was always asking to borrow $10 of my baby sitting money until payday. Financial instruments like that were for rich people only. It was wild when they first started offering C.D. 's at banks. Everyone's aunt and grandma was playing the interest game with their retirement savings account (so much more fun than playing cards! ).And then day trading, wooot, everyone seemed to wish that they could get in on that. See, from personal experience, granted, as a kid, I don't happen to remember the whole of the greatest generation thought the late 50's or 60's were so swell for the "middle class". For one thing, to buy a house, that meant you had to have parents with money to lend you for a major major down payment, a amount of money really hard to save. And those great jobs? Well, I grew up in a very lower class neighborhood, and that my dad was the only one with a white collar job, due to the G.I. bill. I remember some blue collar dads being able to afford more stuff than my dad (a govt. bureaucrat salary) but I also remember a lot of blue collar dads who had no job security, were always being "laid off" when "they cut third shift". (Note the latter, looking back. Factories working around the clock, not normal situation.) And a lot of kids from big families who, though they probably had enough to eat, seemed hungry all the time. On the other hand, so many of the greatest generation I knew at the time seemed to be thrilled with the opening of financial tools to them as well as to the rich in the late 70's. That was what was revolutionary to them. I look at millenials attitude, and I don't see the need for independence from a job with "the man" going away. At the same time, many of them are less materialistic. I really am starting to think, with all the robotization, and less chance of huge world wars, that minimum guaranteed income might be coming sooner than we think. That way, those that want to play the capital game can, and those that aren't interested in playing won't resent them as much. It may also not be that far in the future when countries don't think of a growing GNP as something to brag about. What's more the norm is a big war followed by a decade or more of wonderful rebuilding growth followed by an economic collapse. I believe we had this after the Civil War (except for the South) and WWI. After WWII we solidified our exports and then re-stimulated with LBJ's wars and Great Society so we skipped that downturn? But yeah, gets annoying having smug Greatest Generationers assume givens like GI Bill and GI housing loans etc as "pulling yourself up by your bootstraps". I have family members who did quite well based on a big government project that flooded the local market with new people and full pockets, yet they don't associate their fortune with government largesse - they think they made it all on their lonesome when it was a boom with no shortage of new customers. Prior to the Tax Reform Act of 1986 (TRA86), the interest on all personal loans (including credit card debt) was deductible. TRA86 eliminated that broad deduction, but created the narrower home mortgage interest deduction under the theory that it would encourage home ownership. A New York Times article notes that, in 1913, when interest deductions started, Congress "certainly wasn't thinking of the interest deduction as a stepping-stone to middle-class home ownership, because the tax excluded the first $3,000 (or for married couples, $4,000) of income; less than 1 percent of the population earned more than that;" moreover, during that era, most people who purchased homes paid upfront rather than taking out a mortgage. Rather, the reason for the deduction was that in a nation of small proprietors, it was more difficult to separate business and personal expenses, and so it was simpler to just allow deduction of all interest. In the United States, there are additional tax incentives for home ownership. For example, taxpayers are allowed an exclusion of up to $250,000 ($500,000 for a married couple filing jointly) of capital gains on the sale of real property if the owner used it as primary residence for two of the five years before the date of sale. Economists have demonstrated that high-cost high-income areas receive most of the tax benefit. For example, San Francisco, California receives $26,385 per home while El Paso, Texas receives $2,153 per home, a 1,225% difference. The five highest income metros receive 87% of tax inflows, with over half going into California alone. Thinking of some of the main effect of the 1913 income tax law: borrowing becomes subsidized for people in business for themselves. Over the years, more and more people see the advantage and want to play, especially as inflation makes the cut-off not for rich only. It doesn't say when the IRS started cracking down on keeping business and personal records separate, but before that, surely this had an effect. Before 1913, one of the main benefits seen in owning land is not as a saleable asset but that farmers and gardeners could at least fed their family. And the whole "freedom" thing. The change to home mortgage interest only in 1986 is a direct blatant subsidy to the real estate industry and construction. I recall it fueled the invention of and rise of condominiums where there used to be only rentals. Tax policy has a major effect on where the economy goes. Tax reform: it's complicated. Yeah, my grandfather bought some land during the depresion cause at least could grow something to survive -white collar back to working the land, but was some margin of safety. Where's the Plan B today? And again I was surprised to read via Nate Silver that historically home ownership is a poor investment, except for a small window. I thinkg there are some knickon benefits, but not after 2008. Tax reform/policy has lots of moving parts. But in the end, history teaches a pretty simple lesson, higher top marginal income, capital gains, and estate tax rates lead to broad-based prosperity, less racism, and a happier, fairer society. Regressive tax rates lead to inequality, resentment, and "interesting times." At the very least let's talk a little about fairness. And motivation. And , happiness. Suppose Steve Jobs' had had to settle for wearing a white gown in some Hewlett Packard lab..
Would an 80% + marginal rate have stifled his creativity? Or , more likely , the "animal spirits" of Eric Investor ? To what extent is my "happiness" enhanced by sitting here going on and on while using the output of generations of driven entrepreneurs who might have been a lot less productive but for Ronald Reagen? Could that have been a fairer world? And an unhappier one. We're sitting here quite properly lamenting the disgraces of our society And enjoying its' benefits. I saw that in one of Hal's articles he mentions an 80% + marginal rate that you're referring to but that's part the Sanders/Ginsberg unicorn theory of legislative accomplishments. No one rational is proposing such an increase. It would never pass congress even if democrats had control so I don't see much sense in discussing it. I think we all can agree that at some point a higher marginal rate will stifle investment or stifle a person's willingness to work. The question is what is that point. I read an article that cited a study by several economists that suggested the top rate would have to exceed 70% to affect work ethic and investment opportunities. 70% is also a unicorn that no rational person is proposing so I'm not suggesting it nor will I defend it. I'm not even going to bother looking for the article to post a link. The data is clear that something has gotten out of balance in the capitalistic economy. The lion's share of productivity gains in the last few decades have gone to the top 1%. The wealth controlled by the top 1% has reached astronomical proportions. Rather than investment dollars being stifled some economists claim the amount of wealth in the hands of the investor class has risen to the point that a surfeit of investment dollars has caused a chase for poor investments. I've seen no economists that claim the Bush tax cut, which lowered the top rate from 39.6% to 35%, spurred investment, increased GDP, or caused entrepreneurs to work that much harder. I've seen none that claim when that tax cut expired and the rate returned to 39.6% that driven entrepreneurs cut back on their work hours or couldn't find investment dollars. While I would likely agree with you that an 80% + rate is too high surely we can make some moderate tax increases on the wealthy as one way to deal with the wealth imbalance we're seeing now. Without the next Steve Jobs having to wear a white lab coat. Your argument rests on two debatable assumptions: 1) You assume that tech innovations like smartphones make us happier and 2) we wouldn't have them without low top marginal tax rates. Dealing first with the second. First, most entrepreneurs start businesses because they are creative and think they have a great idea not because of overweening cupidity. Warren Buffett and Bill Gates started Berkshire Hathaway and Microsoft when marginal tax rates were 91% and 70% respectively. They didn't say to themselves, hmmm, maybe I better not outperform the market by 20% every year or build software that will power billions of computers since when my business takes off into the stratosphere, I'll be taxed at a high rate. Elvis Presley didn't decide not to put out hit singles because 50% of the profits went to Colonel Parker and, of the remainder, the U.S. government took over half. No, he recorded hits because that's what musical geniuses do. Second, to the extent that the most successful entrepreneurs retain less of the profits that their ideas generate, they will have a greater financial incentive to keep creating. Third, history shows that low or non-existent income taxes do not result in a flowering of the entrepreneurial spirit. The superrich of 120 years ago used their extraordinary wealth and power to keep labor unorganized and desperate, to game the stock market, to buy politicians, and to prevent competitors from gaining a toehold. Sound familiar? Once a VC tried to convince me that increasing capital gains taxes would prompt many his brethren to just walk away and do something else for a living. And do what? I replied. Teach junior college? He’s still a VC. So how do you craft tax policies that reward those people and activities that you want to encourage but don't necessarily dole out windfalls to the less deserving. If history is any guide, you stop worrying about it. The cause-and-effect between taxation and innovation is low. Innovators seem to ignore economic factors and often thrive best in bad times. Microsoft was founded in 1975, a year that double-digit inflation raged, marginal tax rates hung at 70 percent and “Love Will Keep Us Together” from The Captain and Tennille topped the charts. Apple Computer and Genentech both hit the national scene in 1976. What about the argument that we need all these gadgets to make us happy? I highly doubt it. Depression and anxiety remain as much a part of the human condition as ever. We still have alcoholism, drug abuse, gamaholism, suicide. Indeed, we may now be suffering from record high levels of anxiety, stress and depression. How can this be if social media, smartphones, and laptops make us happy? The answer is it can't be. They don't. My gut feeling is that you're right about entrepreneurs . And Kanellos is wrong about the VC's. And I really like the Internet. Flavius - there was plenty of venture capitalism before the Reagan tax cuts. When venture capitalists hit grand slams they are rewarded through enormous capital gains not ordinary income. We have always taxed capital gains at a different and usually lower rate than ordinary income, although I don't necessarily support the distinction which wrongly elevates capital above labor. A major motivator for people in every profession is the desire to outshine their peers. Higher tax rates lead to a reduction in the net worth of the wealthiest individuals but not their desire to beat the competition. You miss the important distinction between income and capital gains. Income does not involve risk while capital gains are the product of risk taking and even gambling so treating them the same for taxing is crazy or misleading. Any additional taxes on capitl gains will mean less profits remaining for reinvestment and knowing there will be less profits in the future will certainly reduce future investment. Why take on more risk for less returns even if they are competetive minded. Our information/communicstion technology was developed to serve our needs not to make anyone happy. Modern people cannot function without these tools and they have spresd to the remotest parts of the world connecting most everyone. Our basic needs include food, water, heat, clothing, health care. We had (or didn't) all of those before the internet. In the past, even when we had much higher top marginal income tax rates, we had relatively low capital gains tax rates. I guess you support that dichotomy. I don't. I don't think gamblers should get to keep a higher percentage of their winnings than workers get to keep of their paycheck. Moreover, if capital gains tax rates get to a point where venture capitalists don't think the game is worth the candle and with a well-crafted code that shoudn't happen, investors can always borrow from commercial banks. We don't live in the past and the present is the IT age where even the production of the basics you list are dependent on current technology. It certainly isn't all good but IT has changed the way people do business and with whom they can trade. I found buyers for classic car parts in Japan and Europe along with all the US that were unreachable before the internet. Liberals need to get past their fixation on taking people's wealth with tax and spend schemes and produce ideas on high paying job creation but not with the Potemkin Green agenda. I don't think that commercial banks make many venture capital type loans, they require lower risk and some collateral. The risks that wage earners take are far greater than the risks entrepreneurs and VCs take. Remember the Facebook movie? The conflict was decidedly not that anyone involved, from the inventors to the early investors, were going to wind up financially ruined. It was all about who was going to control the final product and whether or not it would prove to have been worth all the effort. Entepreneurs are typically privileged. Professional investors worth their salt never invest more than they can afford to lose. The real risks in this economy are to the wage earners -- people who go to work every day but do not control their fates. Venture capitalists are not entrepreneurs they are investors with a high tolerance for risk though they may end up owning part of the companies they fund. That risk was shown after the huge losses some of them suffered when the dot-com bubble burst. Life is risky but this is about investors taking financial risk for large rewards if they choose wisely and are lucky. Venture capitalists mitigate the risks they take through research, conviction and portfolio construction. The principals of these funds risk only the personal capital they can afford to lose and their investors, generally high net worth individuals, family offices, endowments and public or private pensions, do the same. The risks to investors in responsibly practiced venture capital are well managed and the rewards are so great that the whole structure hardly relies on a preference for capital gains over income baked into the tax system. I'd argue that the risks to wage earners are, in fact, so much higher and more existential that we should flip the paradigm and tax wages at a lower rate than unearned income. Thanks Michael. I appreciate this thought-provoking blog and your informative comments. I'd suggest maybe you're seeing too much of VC's in New York & Silicon Valley. Out here in the real world, early stage investment is fraught with peril, and the rate of failure is sky high. One reason for Germany's overall slowness to capture tech markets is they're very reluctant to take the risks on this kind of investment that we do. If anything, Our recent careful approach with all these overtuned "incubators" may effectively rig the system against the actual innovators and in favor of the investors - asking too much equity for piddling up-front cash for desperate entrepreneurs. Said simpler: it ain't that simple. Venture capitalist may be nasty rich people but they do serve an inmportant piurpose in our economy. They venture to supply the funds that make some startup businesses possible and if they are successful then often high paying jobs are created. This makes possible the growth of people with good incomes to carry the weight of the huge nonproductive segment of our population. Doing anything to penalize these investors will reduce that job creation so higher taxes are adding to the risk faced by job seekers or holders. I understand the desire and need some people feel about judging and punishing the wealthy but these taxing schemes will punish moderate income earners more than the wealthy when their retirement accounts and small investments are targeted. The wealthy can move their wealth and investments offshore while wage or salary earners must face the tax man. That's the spin that republicans and conservative economists want us to believe. But as always it's much more complicated than that. That huge nonproductive segment is actually mostly productive. They're doing work that needs to be done and they're doing it forty or more hours a week. If they stopped doing it the system would collapse. The problem is that this group that we call the working poor don't get enough money from those forty hours of work to pay for a place to live and raise children and enough food for their family to eat and health insurance when someone gets sick. Something on that list has to give. Live in what used to be called a hovel, now its a crappy trailer. Let the children go hungry, don't treat them when they get sick or even have a cavity. No glasses if their eyesight is weak even though that affects their performance in school which relegates them to an inevitable cycle of poverty. Something has to give when there's not enough money for even the necessities. Should we care? They're only white trash, trailer trash. Most people getting food assistance and other aid to the poor are not the unproductive unemployed. Most have jobs. They're the working poor. let them and their children rot in their poverty or help them? With food or housing assistance, with health care? Or adjust the system so those who work earn enough to live on? Venture capitalist many be nasty rich people or they may be kind caring rich people. They may serve a useful purpose in our economy or they may not. They may supply the funds that make startups possible or they may swoop in like vultures, borrow and mortgage the company, sell off the assets, plunder the retirement funds, and eventually put the company through receivership and bankruptcy with everyone in the end as losers, except the venture capitalists. There was a time when the system incentivized long term growth. Now it incentivizes short term stock gains, borrowing, and selling off assets. That's a choice we've made through our government. So are we talking about the venture capitalist or the vulture capitalist? It's true that the wealthy can hide their money in places like the Caymans. Isn't that a problem in and of itself? It's not an argument for or against raising taxes. We can debate whether the tax rate should be higher or lower but what ever the tax rate taxes should be paid and stashing assets in hidden accounts off shore is a problem that needs to be addressed. Isn't it? Beautifully put, OK. I have nothing to add. I wonder if you are really this confused or you're just sowing confusion. The working poor, who i didn't mention, pay their own way and support the system with consumption and some taxes while about 60,000,000 other people don't work or pay taxes because of various disabilities. These people, through no falt of their own will never support the system and must be cared for with programs such as Medicaid, SNAP and other support. You are confusing venture capital investors with corporate raiders that do get their money from commercial banks, Bain Capital is an example.I'm fairly certain that taxes must have been paid by these venture capital investors on the profit they are investing so there is nothing to hide in the Caymens although I wouldn't be surprised if some of them might try to hide their profits. What i was refering to was that they are free to take their investments to other countries that may offer lower tax rates or they may just reduce their investments here reducing the chance for more jobs and new businesses paying taxes. If, moreover, the rate of return on capital remains significantly above the growth rate for an extended period of time (which is more likely when the growth rate is low, though not automatic), then the risk of divergence in the distribution of wealth is very high.